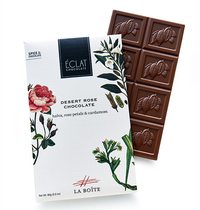 Desert Rose Chocolate 2.2 oz / 60 g (Eclat Chocolate) - Penn Herb Co. Ltd.
A blend of Eclat chocolate and La Boîte spices. Made with 39% Milk Chocolate infused with Desert Rose (halva, rose petals, sesame and spices). 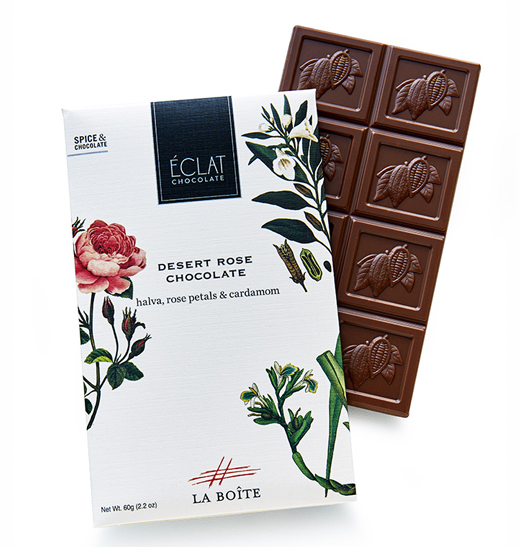 After working together for several years on various collaborations, Éclat Chocolate Master Chocolatier, Christopher Curtin, and La Boite Spice Master, Lior Lev Sercraz, have joined forces once again to craft exclusive chocolate bars. Combining Christopher's authority on chocolate, Lior's expertise in the art of spice blending, and their mutual passion for world travel, this sweet meets savory line of spiced chocolate bars brings to life an exciting fusion of flavors to delight all the senses. Milk Chocolate (min. cocoa mass 39%, sugar, cocoa butter, soya lecithin, natural vanilla), Halva, Rose Petals and Cardamom. Produced in a facility that handles peanuts, tree nuts, milk, and soy.